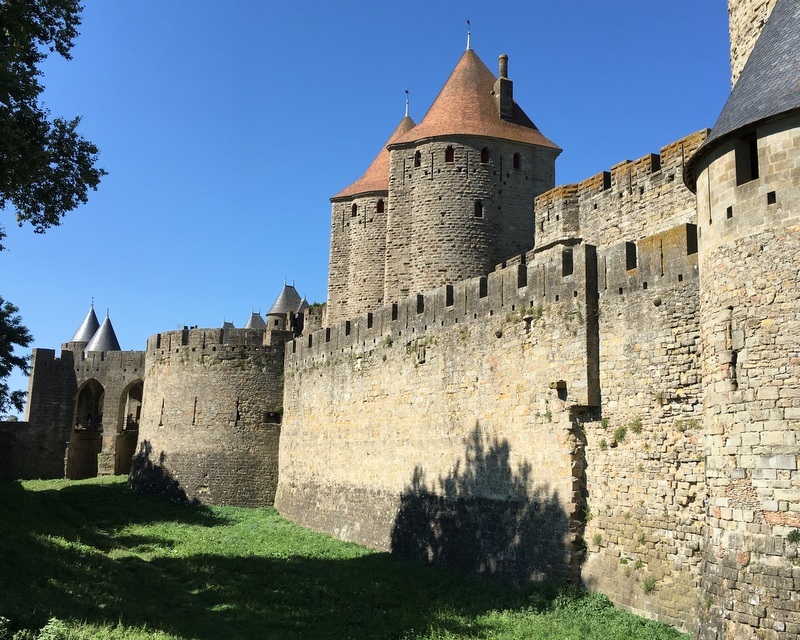 See France 2018, part I , for the first part of our trip to France. Here is again a map of the places we visited. In 1976(! ), after my graduation, I applied for a position as a physics teacher at a school in Amstelveen. The rector (headmaster) in those days was Dr B.C. Poeder, he interviewed me and decided to give me the job. He retired long ago, but we had become friends and kept in touch. Therefore I knew that he was now living in France, in the region that Aric and I were going to visit. 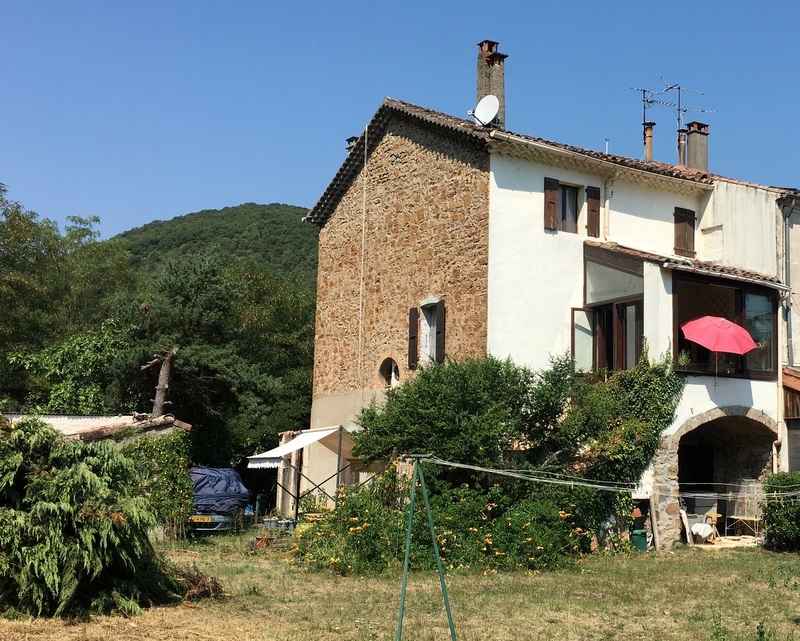 I wrote to him, and he invited us to stay a few days in his house, in the small village of Robiac, about 50 km north of Nîmes. Take the road via Vézénobres, he suggested. Walking around we were wondering if there was a place to have some food. 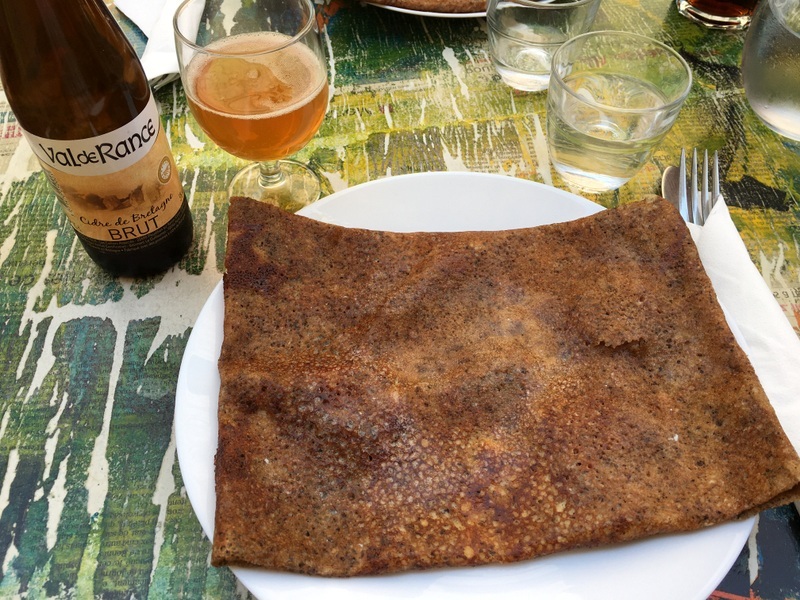 We were lucky, found a nice shop where they prepared crepes and galettes. I had a glass of cider. Very nice people too. 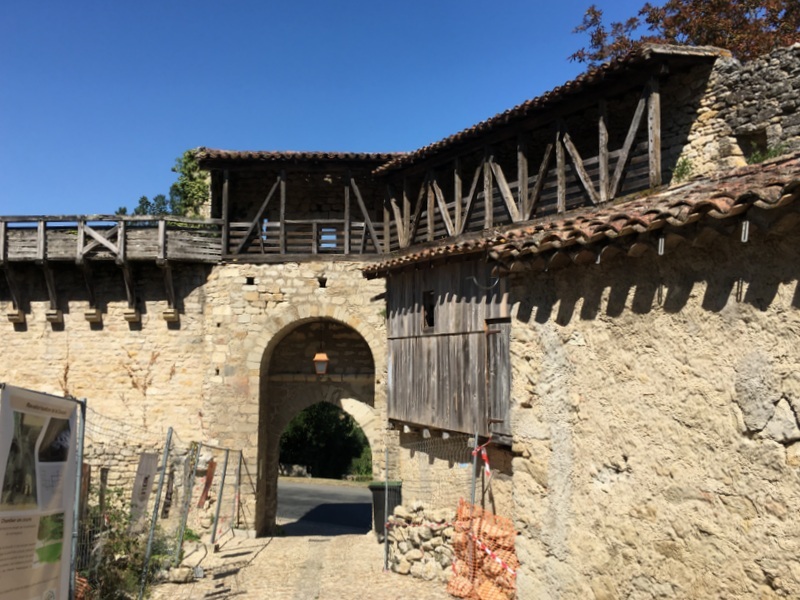 When we arrived in Robiac, Carel was already waiting for us at the roadside, otherwise we might have missed the small road leading to his house. 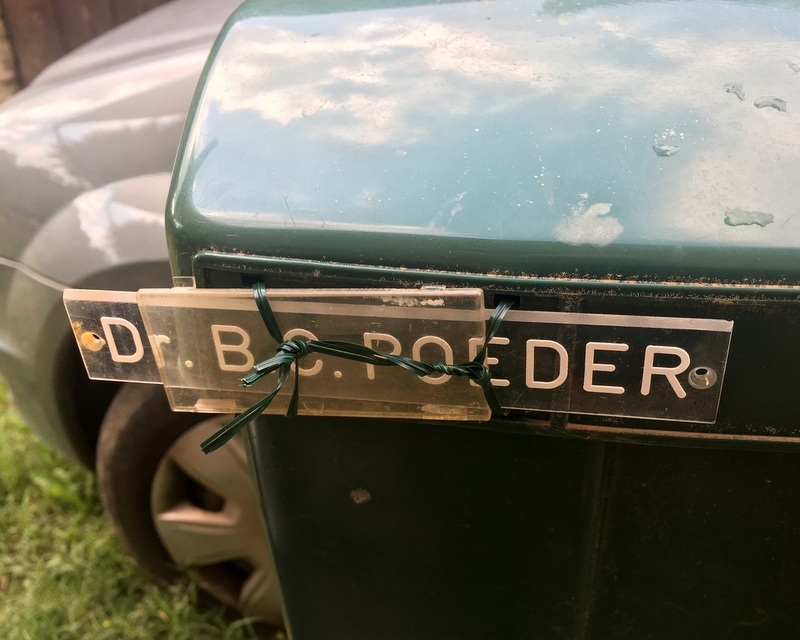 The nameplate on the letterbox still refers to his past as headmaster :-). We were warmly welcomed by Carel and Joanne, his wife. The house is part of what before has been a school. The basement, formerly a goat stable, has been transformed in a guest room. It was still very hot! A big garden with many flowers. Our hosts invited us for a nice dinner in Barjac, a nearby village. 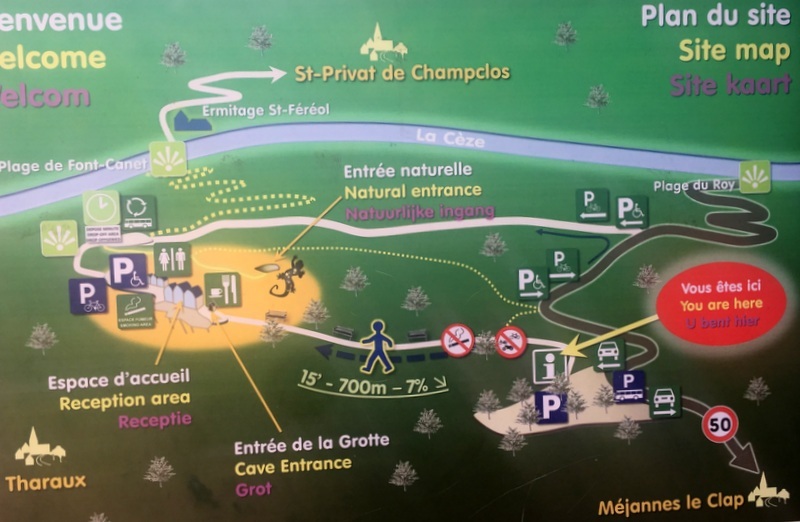 The next day we enjoyed the swimming pool and the hospitality of Carel and Joanne, but also made a trip to a cave, the Grotte de la Salamandre. This cave was discovered in the 60s, access was possible only by abseiling through a hole above the cave! Five years ago the cave was opened to the public after an access tunnel had been excavated from the side of the hill. You can still rappel down in the original way ( for an extra fee), we chose the tunnel..:-). 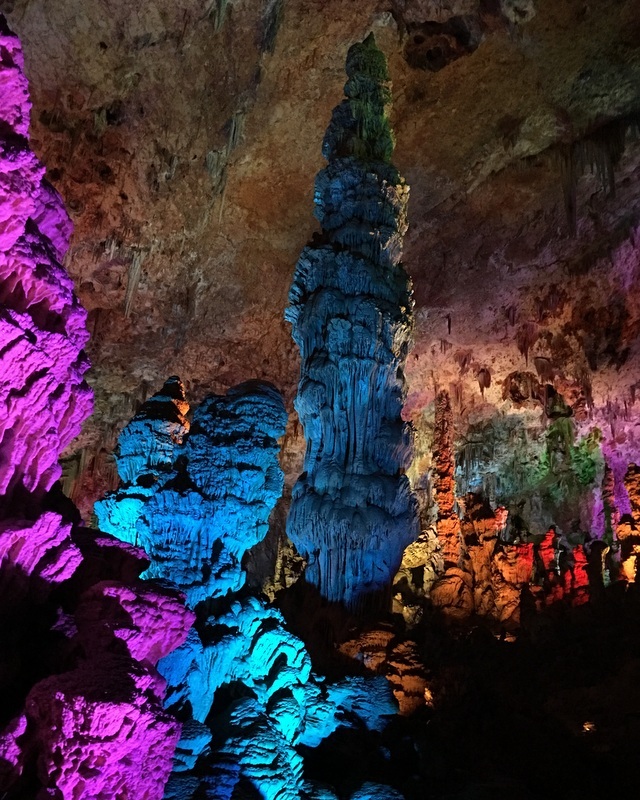 A guided tour, clear explanations, the stalagmites and stalactites were illuminated with varying colors, some really very bright, but also with normal white light. When you click on the left picture below to enlarge it, you can see at the top people who are abseiling from the hole in the roof! The next day we said goodbye to our hosts and continued our trip. 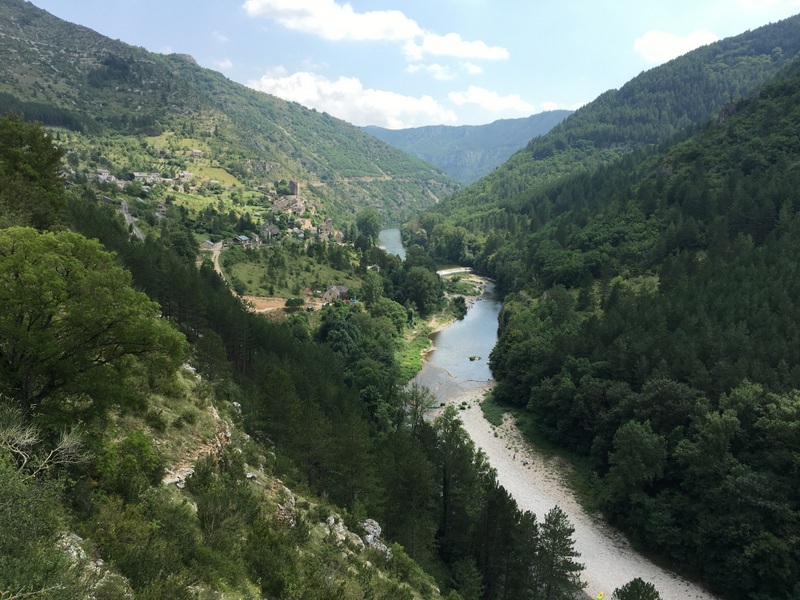 We had decided to follow the Gorges du Tarn, a long but very scenic route. It is a canyon, 400 to 600 meter deep, eroded by the river Tarn. 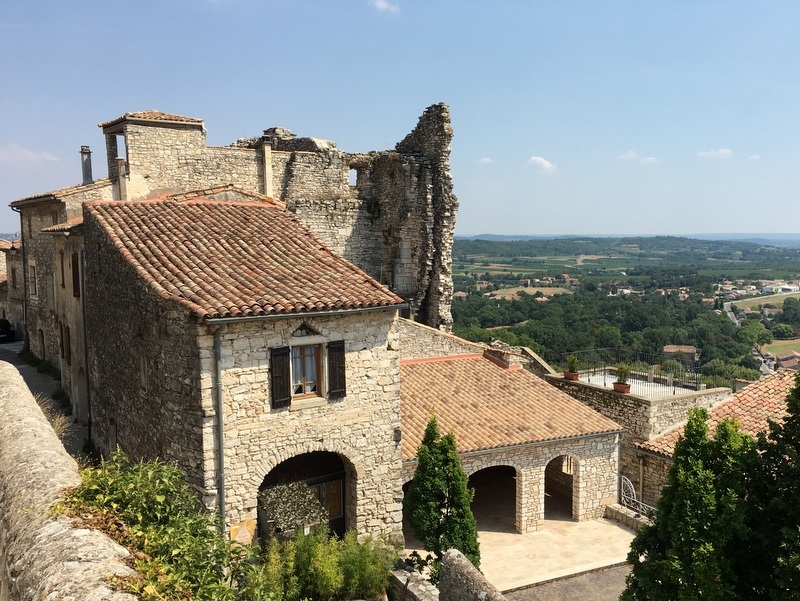 Spectacular views, like here of the village of Castelbouc, deep down. 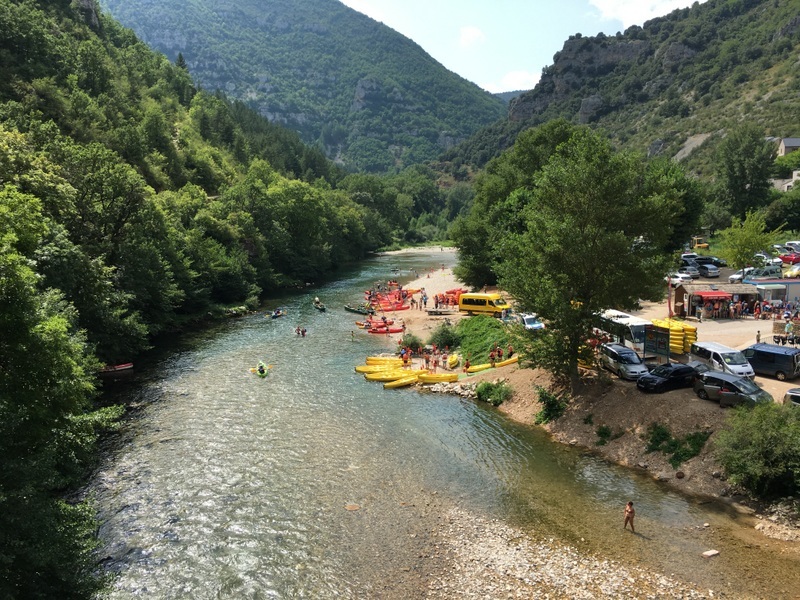 The river is a favourite playground for kayakers. 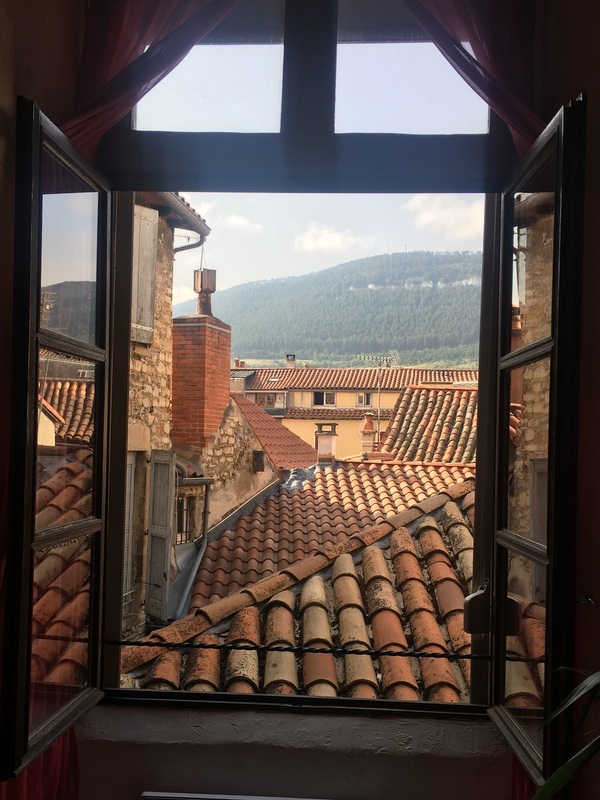 We stayed overnight in Millau, our Airbnb was a nice apartment, located in the historic center of the town. 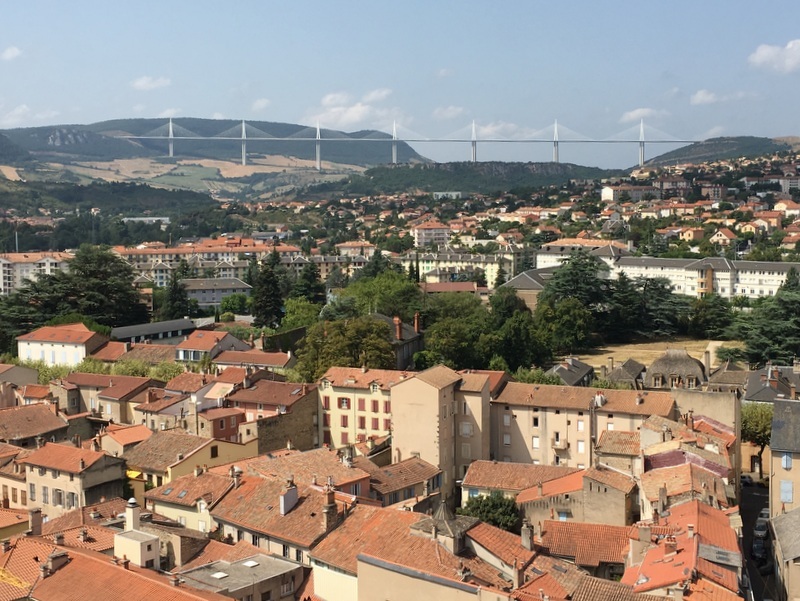 Millau is nowadays known for its viaduct, but it turned out to be a surprisingly attractive town itself. 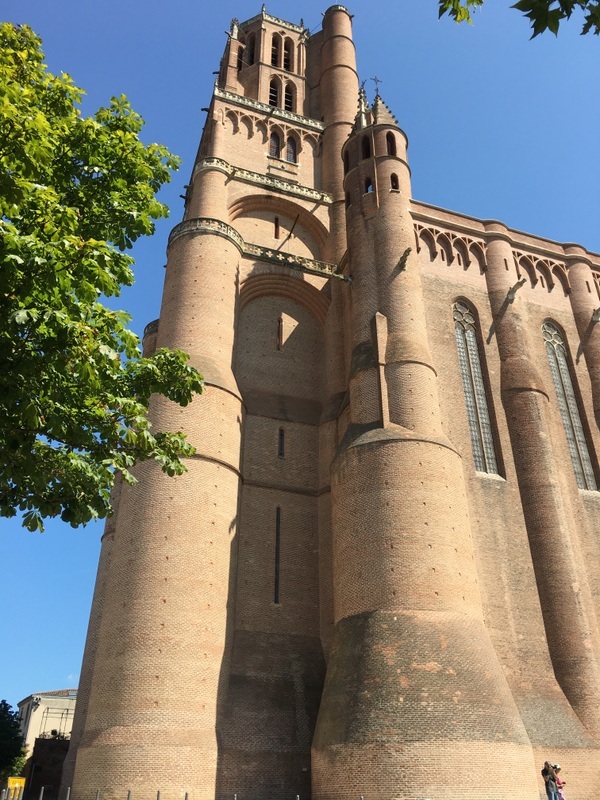 The next morning we climbed the Beffroi, a bell tower consisting of a 12th-century square tower topped by an octagonal 17th-century tower. It was a steep climb, but the view was worth the effort. 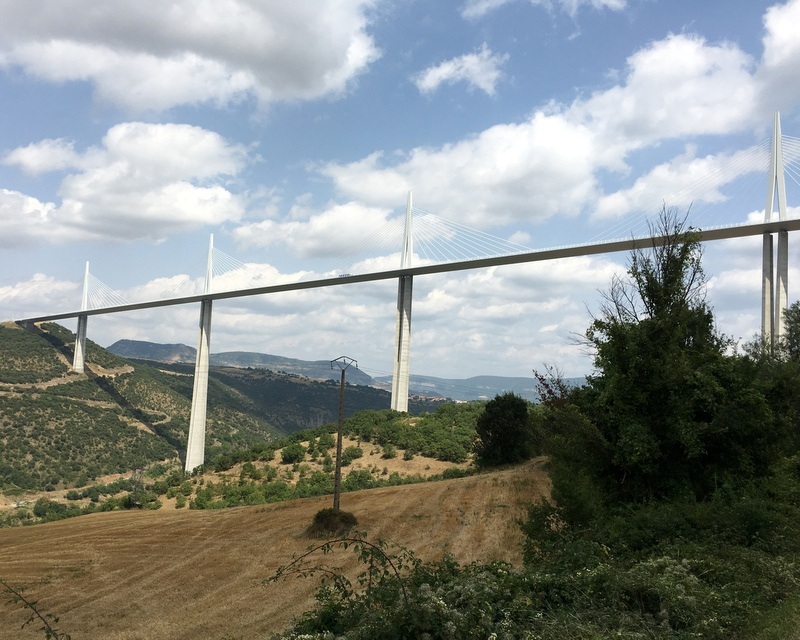 The Millau viaduct was of course clearly visible and deep down the Halles, built in 1899. 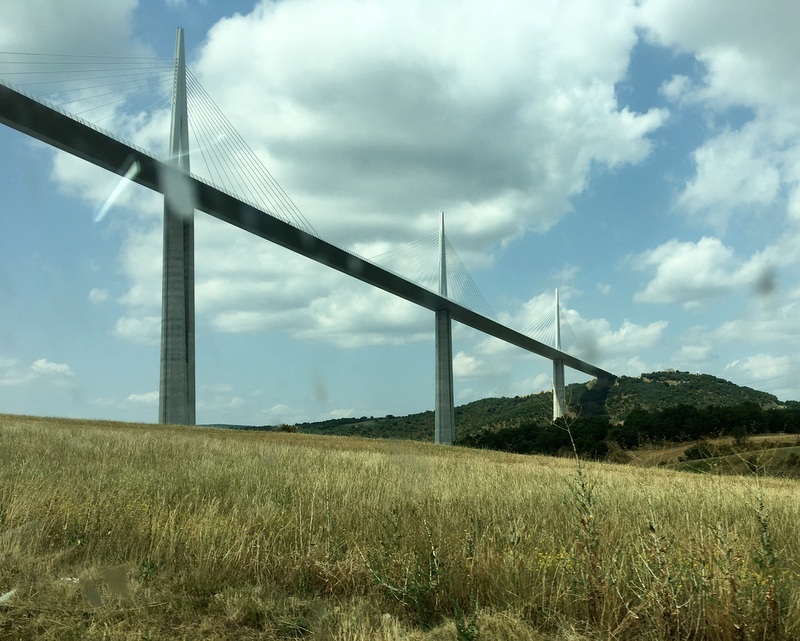 In the Middle Ages Millau was an important town, especially because of a bridge across the Tarn river, consisting of 17 spans. Nowadays only one span remains with a house built on it, formerly a watermill. Very scenic. In a nearby cafe we had coffee with a piece of fouace, a cake specialty of Millau. 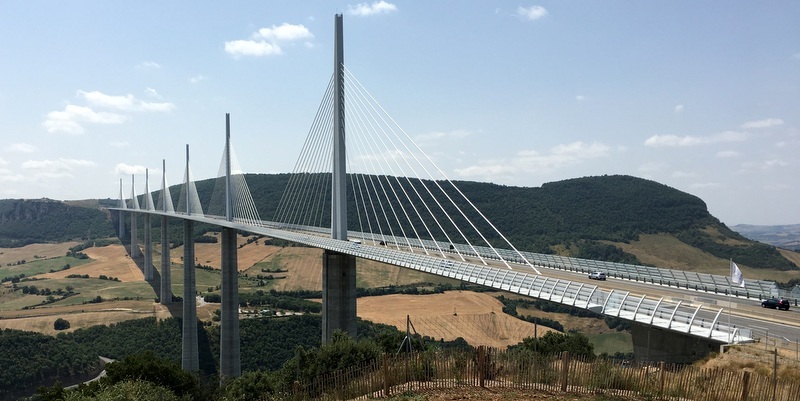 The Millau viaduct is (at the time of writing) the tallest bridge in the world, with a height of 340 meter above the river Tarn. It is considered one of the great engineering achievements of all time. The viaduct has become a major tourist attraction. We drove over it and also under it, when you look up at the supporting pylons from the river valley, they look so fragile! 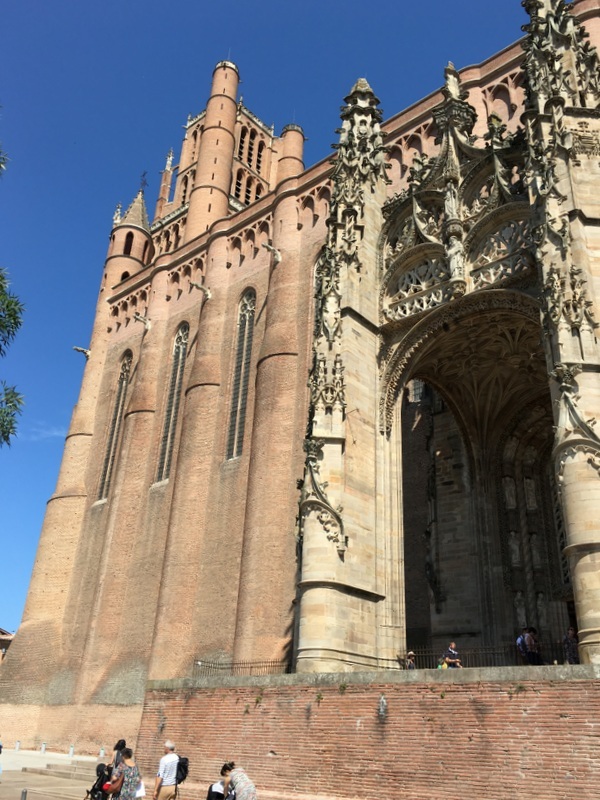 Our next destination was Albi. Here a view of the town with the Sainte Cécile cathedral and the Vieux Pont (Old Bridge) in the foreground. This bridge was originally built in 1035. 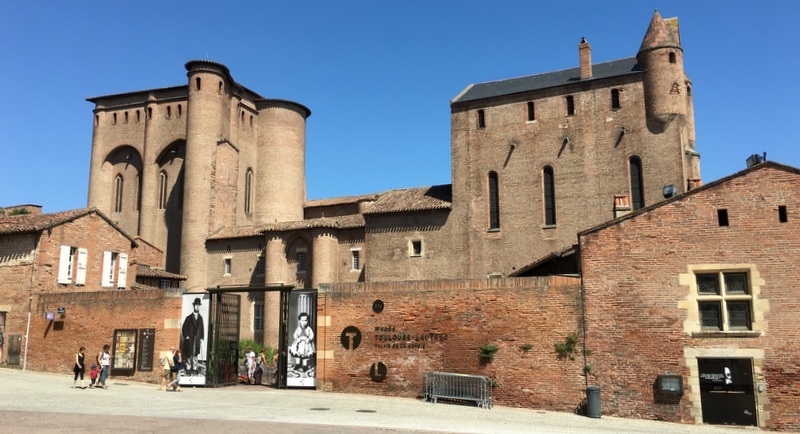 The cathedral is an amazing building, constructed between the 13th and 15th century. Those were the days of the Cathar Heresy, and the Roman Catholic church wanted to make a clear statement of strength. What a contrast with for example the Notre Dame in Paris! 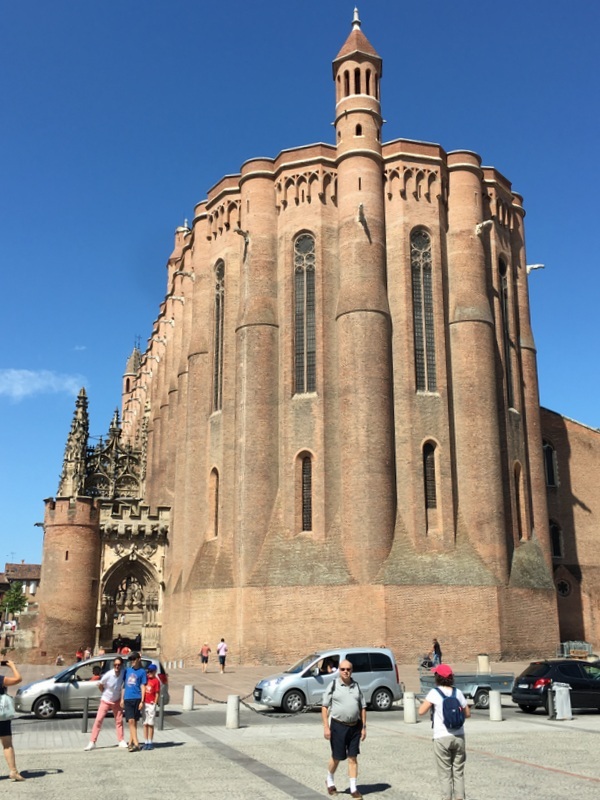 It looks like a fortress and is claimed to be the largest brick building in the world. The austere outside forms a strong contrast with the flamboyant interior. But the gardens of the Palace are beautiful. 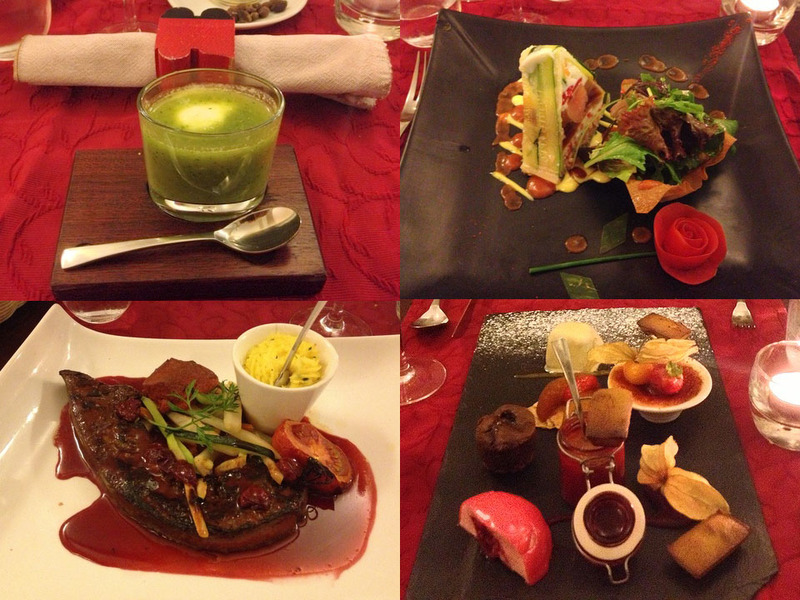 For dinner, our hostess had advised us restaurant Lautrec in Albi and that was a good choice! 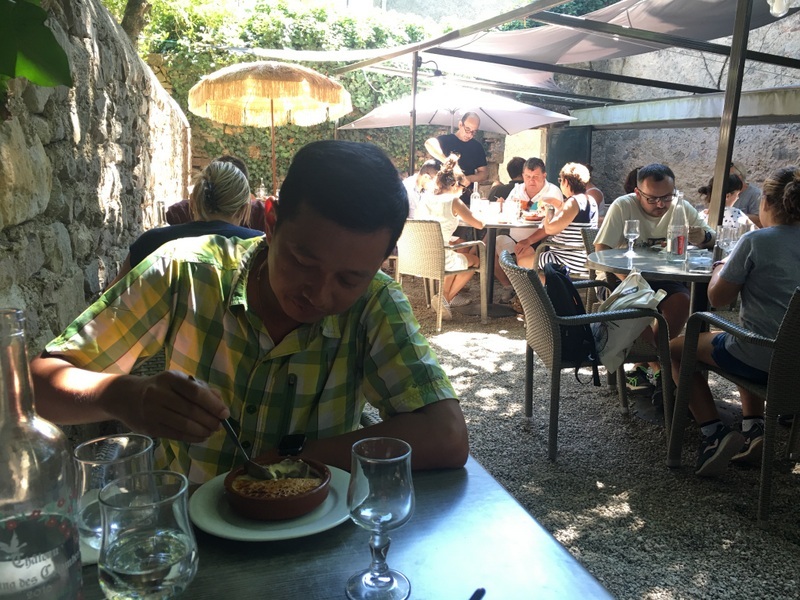 We parked our car outside the walls and explored the narrow streets, visited the church and had lunch. We had lunch in a nice restaurant , Le Clos d’Adele. Good food, pleasant service, value for money. After lunch we visited one of the other attractions of Lautrec, a 17th century windmill. A steep climb, but worth the effort, we could enter the mill and had a nice view of the surroundings. When there is enough wind the mill is still operating. With Airbnb the host often doesn’t live in the same building, so you have to contact him/her about your arrival time. 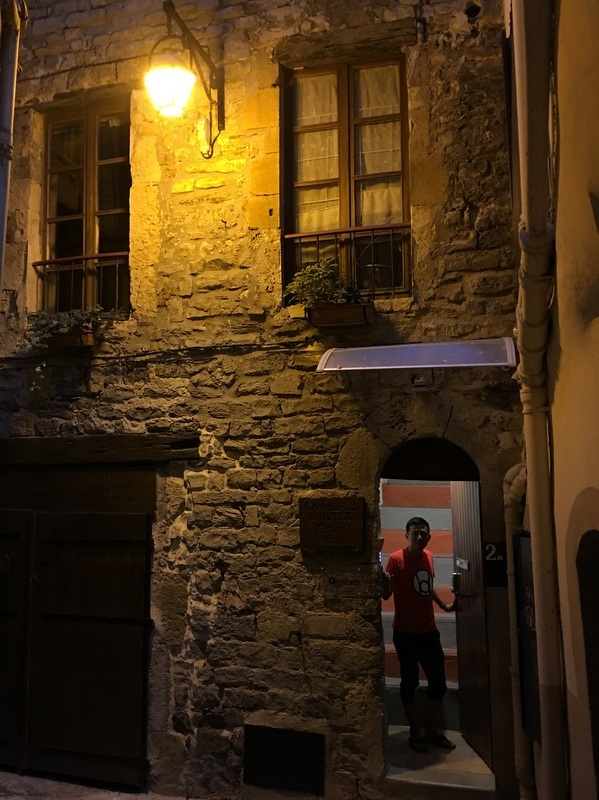 That works well in general, but in Carcassonne it took us some time, the apartment also looked more like a hotel room. But it was ok, from our window we could see the medieval fortress in the evening light. 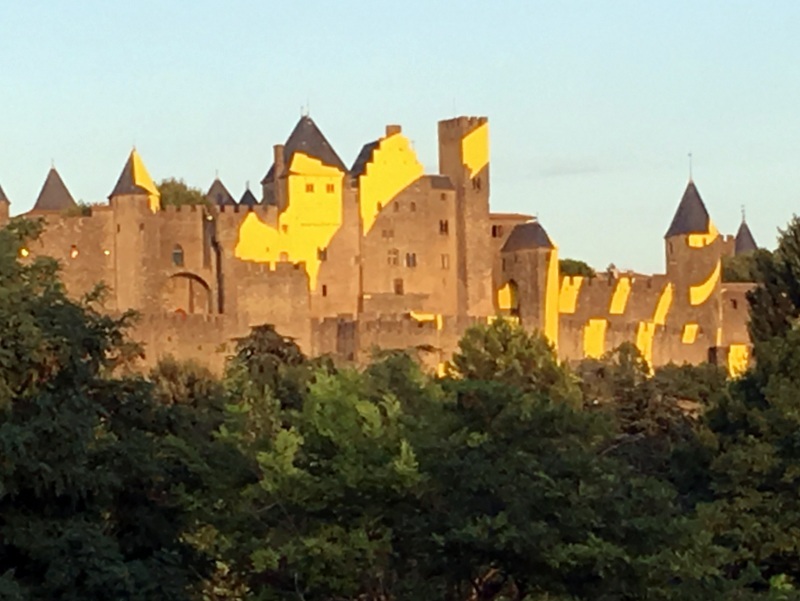 But what were those strange yellow surfaces on the walls and towers? The next day we explored the old town. It the largest walled city in Europe and really impressive. The Church of Saints Nazarius and Celsus was built in its Gothic form at the end of the 13th century on the site of an earlier church. 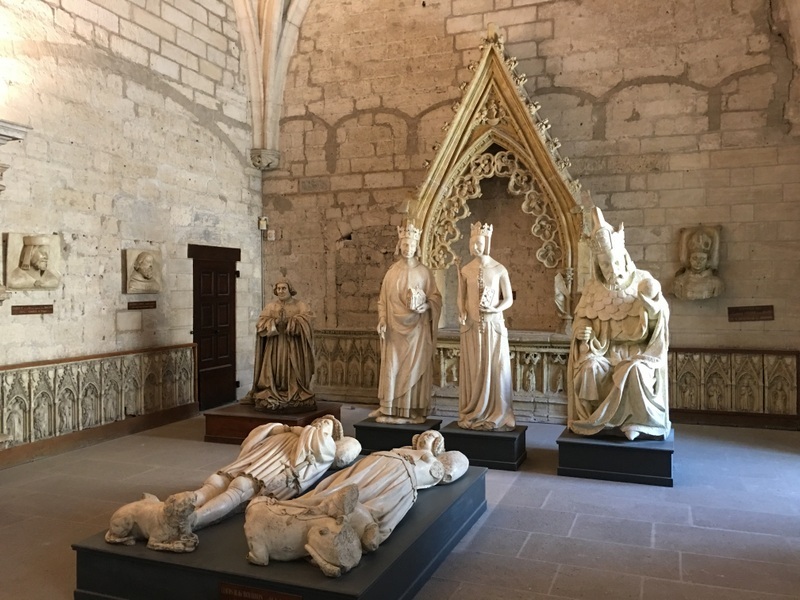 It was the cathedral of Carcassonne until 1803. Beautiful interior. 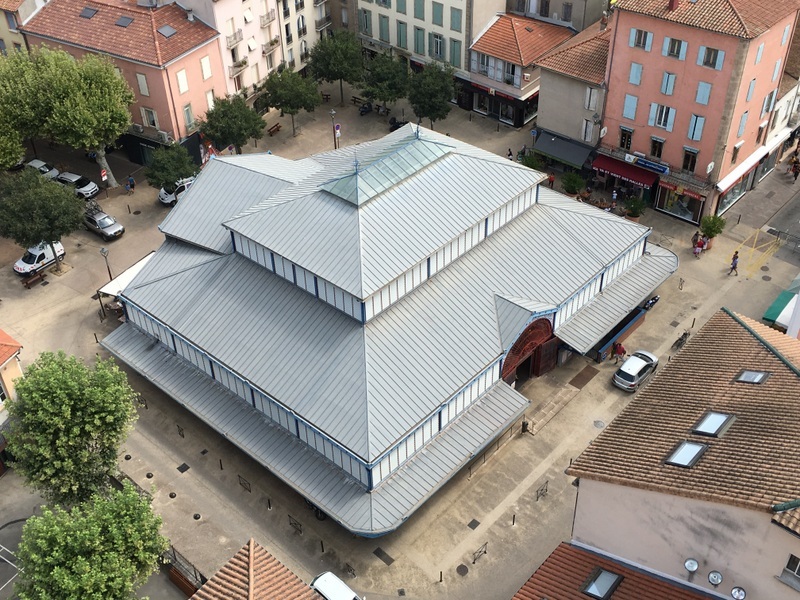 But keep in mind that this church and also the citadel itself have been “renovated” in the 19th century by the French architect Viollet-le-Duc! 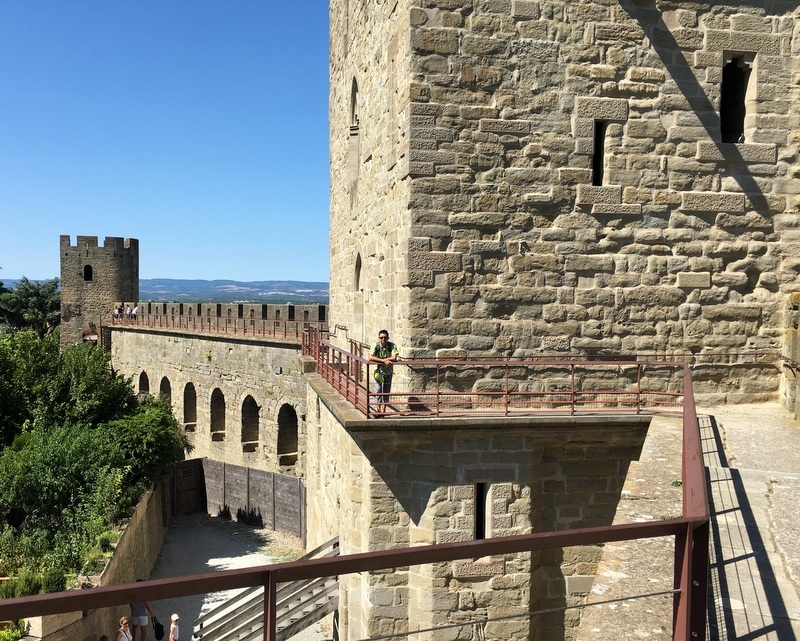 Access to the medieval city is free, but to access the fortress and the walls you have to pay an entrance fee. 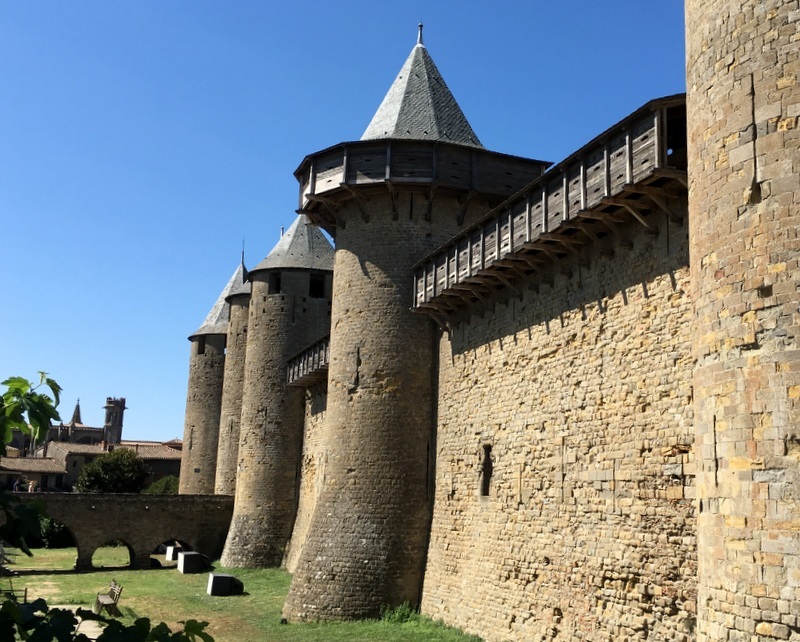 Carcassonne is a Unesco World Heritage site already for 20 years and of course that had to be celebrated. The Swiss artist Felice Varini was asked to create a project. 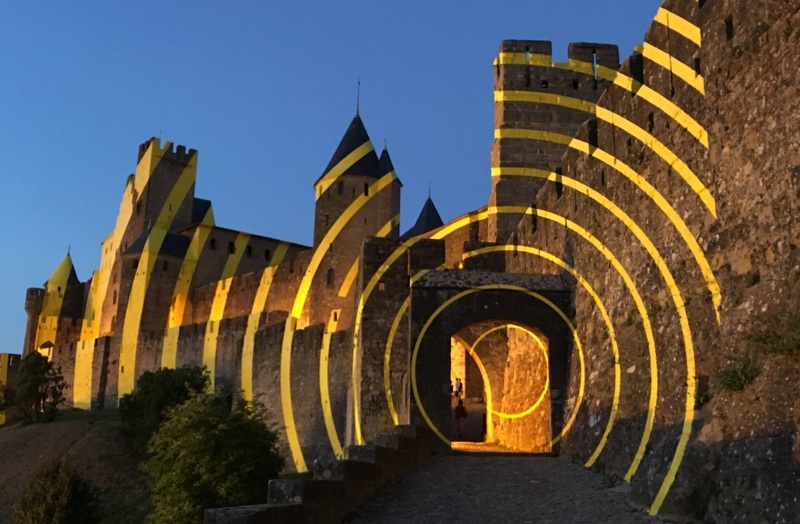 In this case he projected concentric circles on the walls and towers of the citadel. They look broken, only from one vantage point they are circles. Quite spectacular, of course many specatators, not easy to take a picture without people. 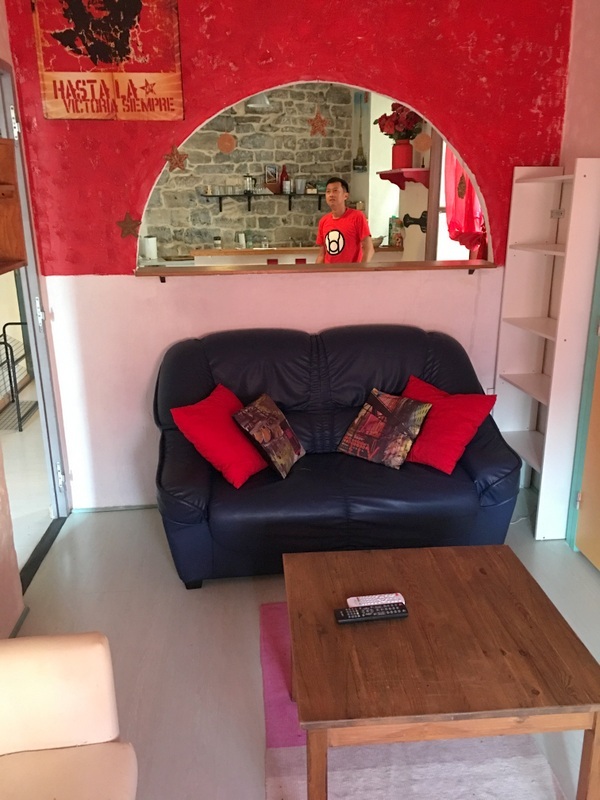 Our trip was coming to an end, our last destination was the naturist village of Cap d’Agde. On our way we passed this strange landscape, the Étang de Montady, a wetland, drained in the 13th century. 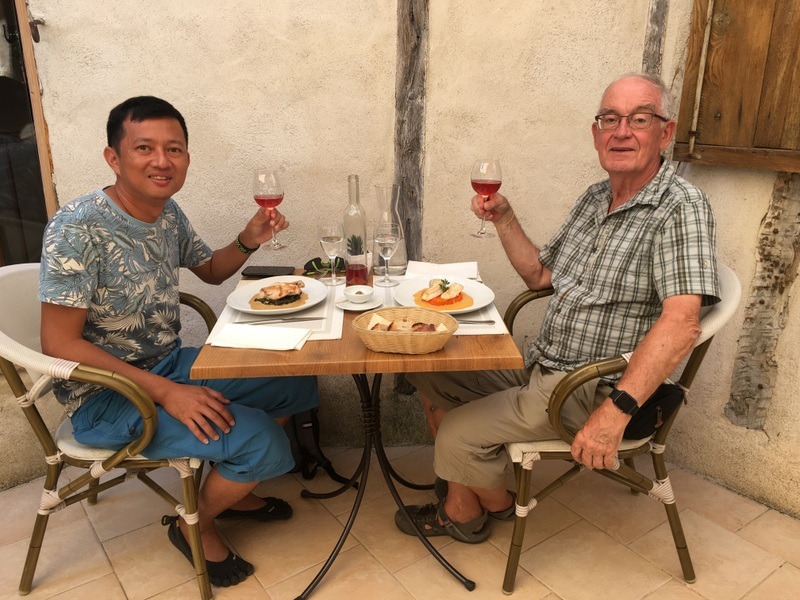 Bernard had two other guests, Christiane and Alain, a nice couple who had been regular visitors of Cap d’ Agde for many years. We became friends almost immediately…:-) The village itself is a nondescript conglomerate of concrete apartment complexes, but the company made our visit very enjoyable. When Aric and I visit the Netherlands, we always try to combine it with a short trip to another European country. In 2014 we have visited Norway, and in 2016 Portugal. 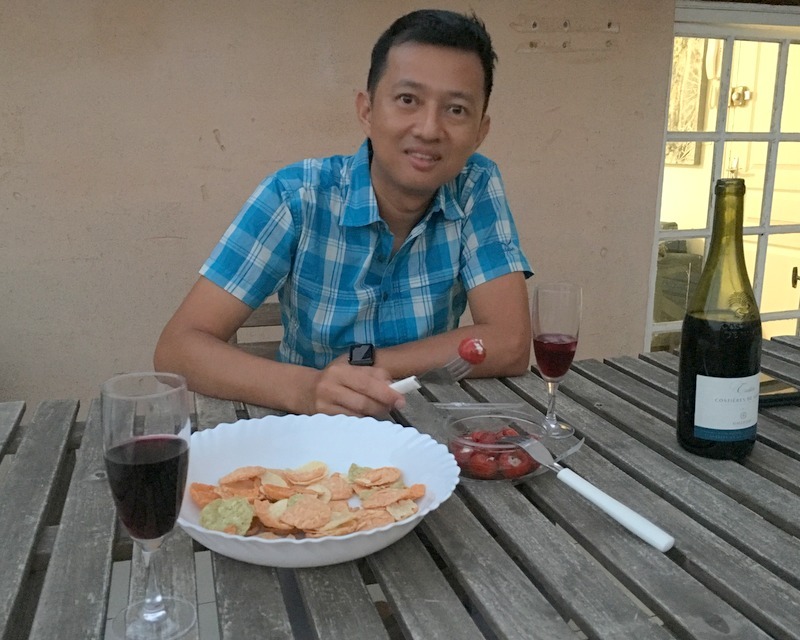 This time we went to the Languedoc region in Southern France. 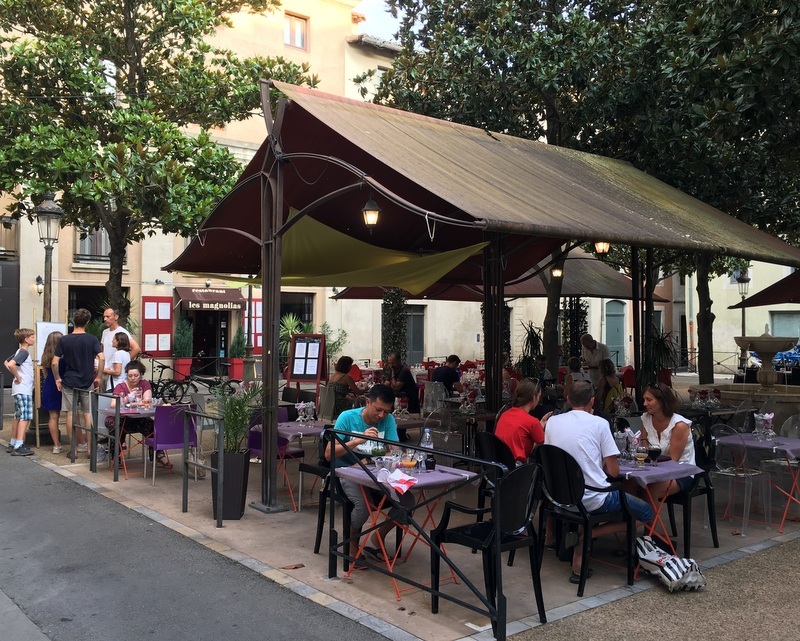 We wanted to visit the famous “village naturiste” of Cap d’Agde, in combination with some of the numerous historical towns in the region, like Arles, Avignon, Carcassonne. 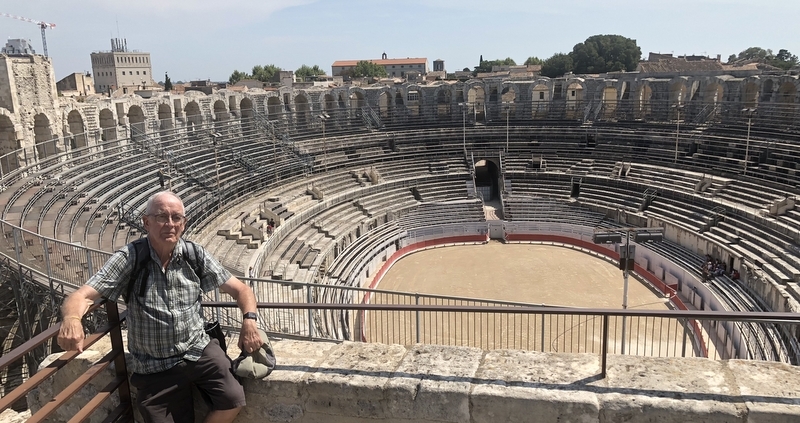 Our first stop was in Nîmes where we stayed three nights in an Airbnb. 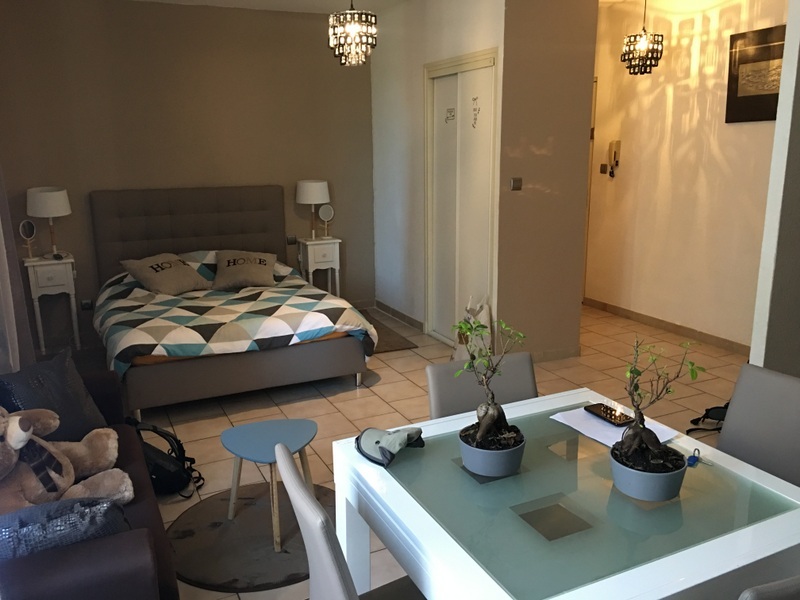 A nice apartment, on walking distance from the historic center, only a bit difficult to find a parking place. After arriving in the apartment, I discovered that I was missing my passport and driving license! Searching my luggage and the car, nothing. Panic! Could I have dropped it when I entered the rental car? A telephone call to Avis in Montpellier finally gave the solution, they apologised that they had not given back the documents after photocopying them! Of course it was my fault not to have asked them back, but what a relief. 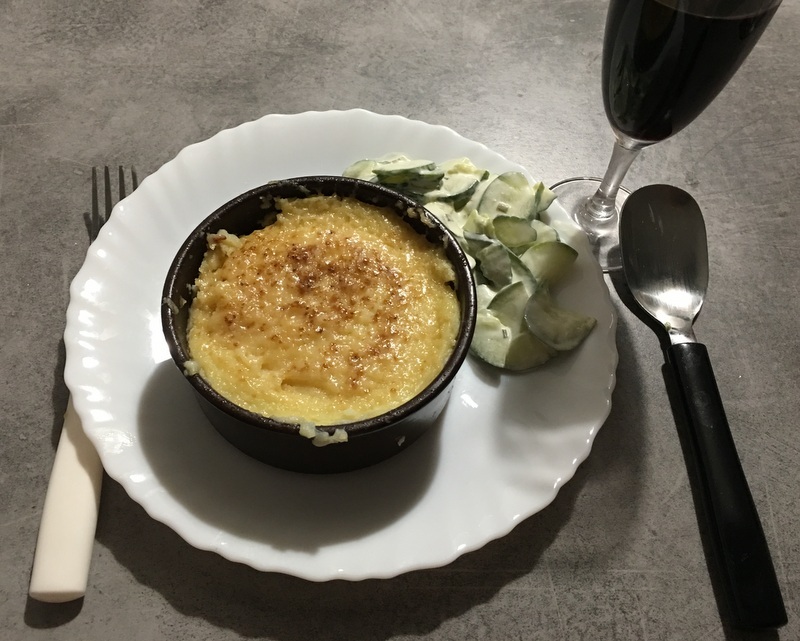 We were not in the mood to look for a restaurant, so we bought food in a nearby Carrefour supermarket and had a drink on our own balcony followed by a microwave dinner, Brandade de Morue, a typical Nimois specialty . 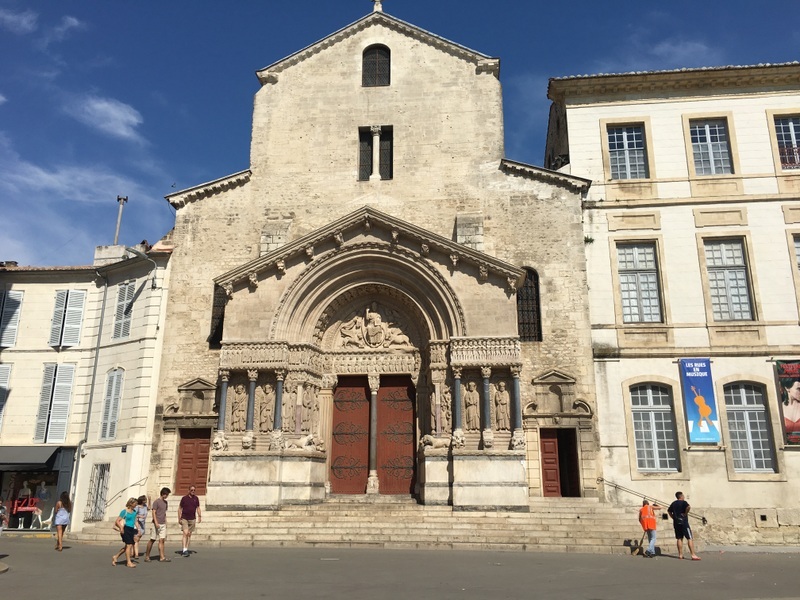 The next day our destination was Arles, but first we had to go back to the airport to collect my documents. 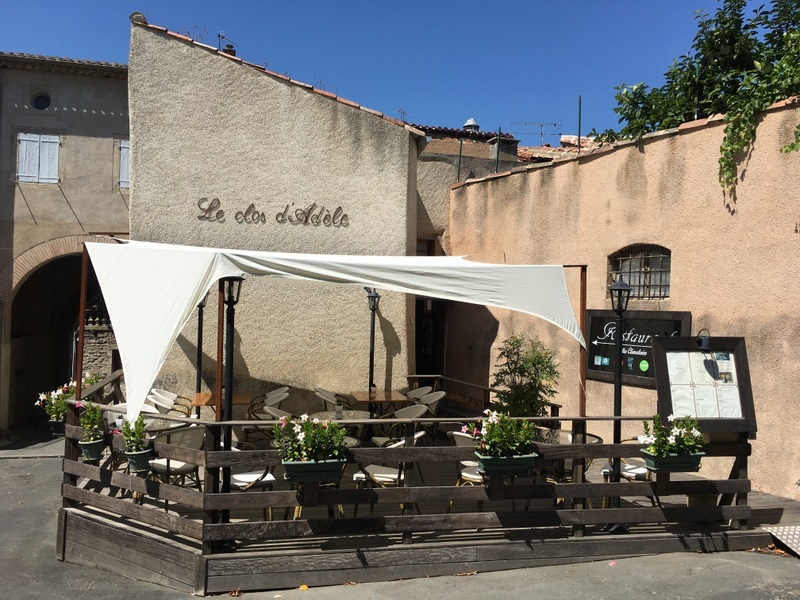 From there we drove to Arles through the Camargue and on our way we found a very nice place for lunch, le Resto de Paty. Isolated location, we wondered if it was open, but it was , friendly service. We had tellines as a starter, a kind of clams, similar to the Malaysian lala. The main dish was grilled Camembert with charcuterie , delicious but filling 🙂 Really a lucky find! 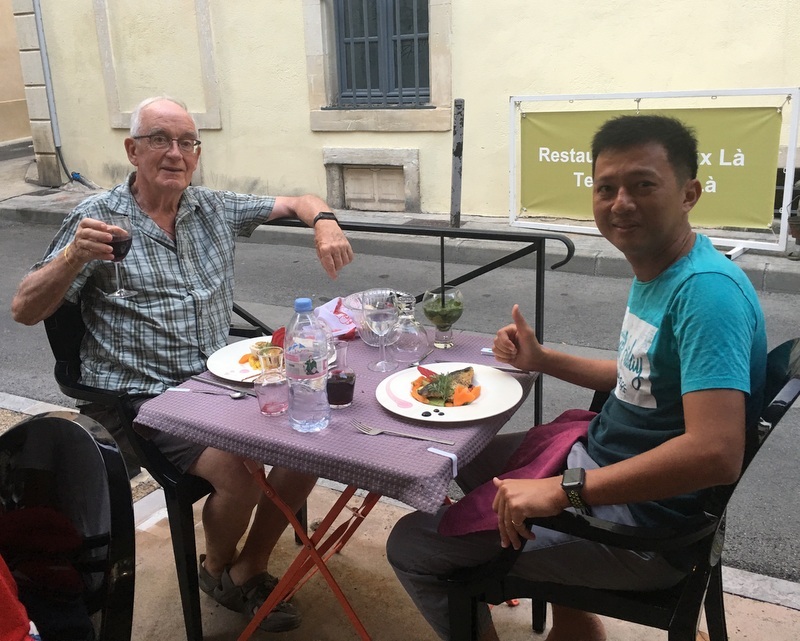 You can easily spend days in Arles, but we had only a few hours. Fortunately we could park near the center. Here is a GE view, with the places we visited. The Roman theatre was built in the 1st century BC and is one of the oldest stone theatres in the Roman world.. It is used now for concerts and events, which rather spoils its visual appearance. Much more impressive is the amphitheatre, built in 90 AD and capable of seating over 20.000 spectators. 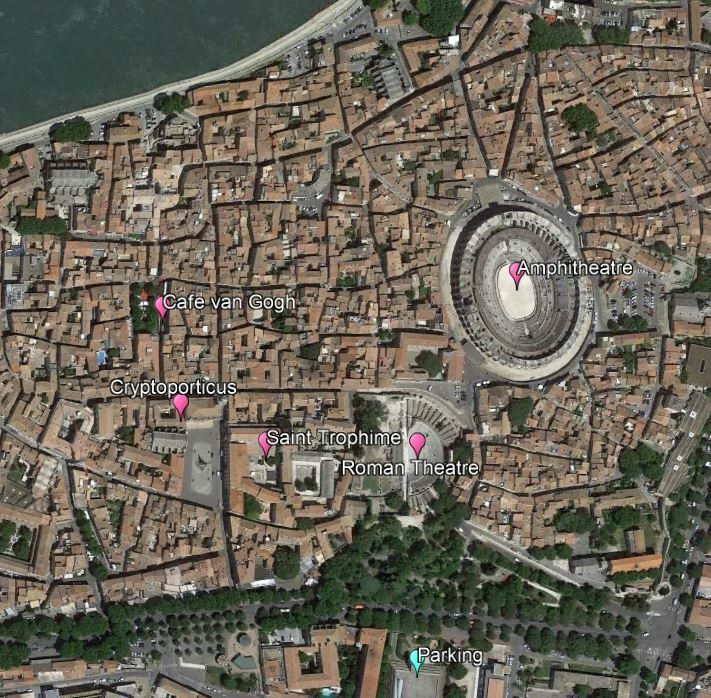 In Roman times it was used for chariot races and gladiator fights, nowadays for bullfighting and concerts. 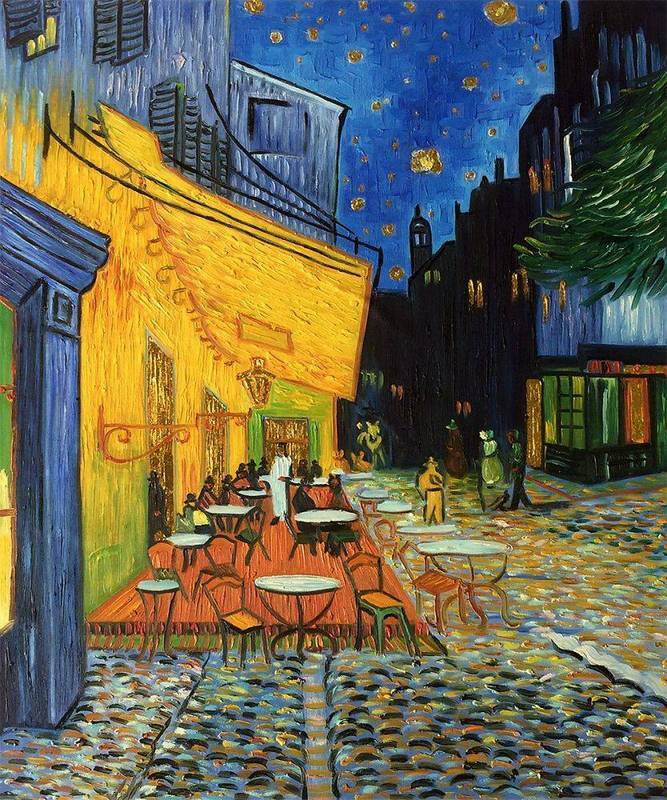 Many visitors will come to Arles because van Gogh lived there more than one year and created some of his most famous paintings. 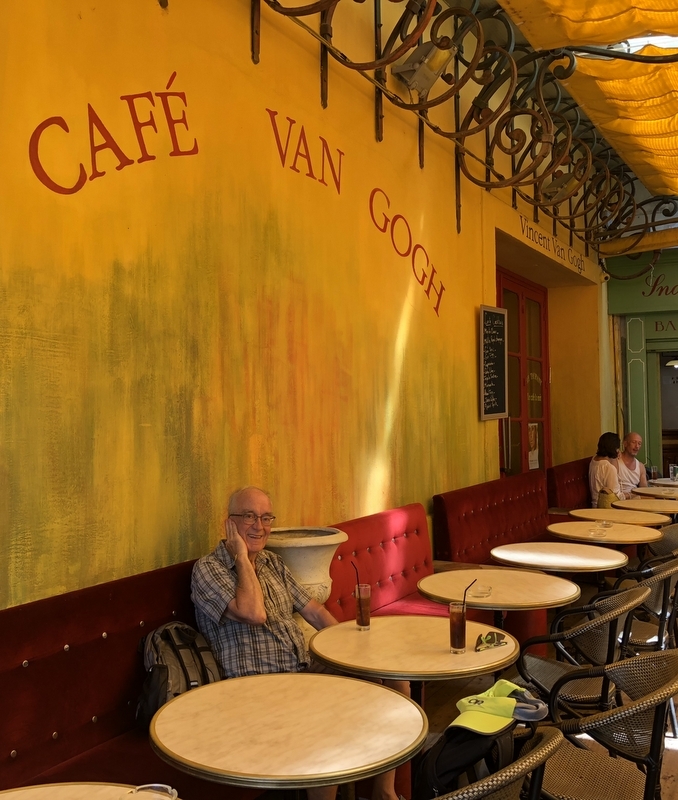 Through narrow streets we walked to the Place du Forum, with the cafe, painted by van Gogh. 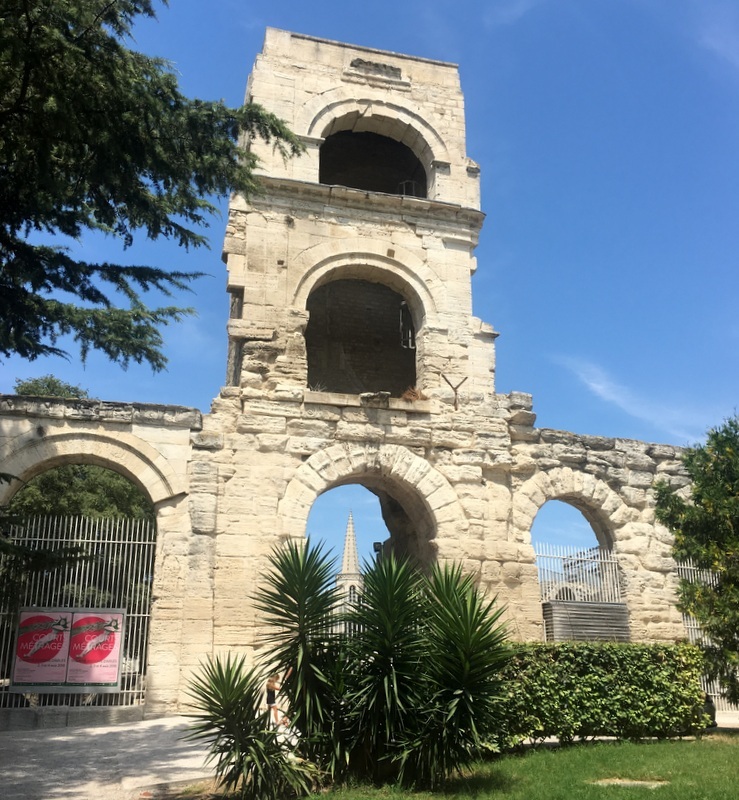 Our last destination in Arles was the Saint Trophime church, but on our way we passed the entrance of the Cryptoporticus, and we visited this intriguing foundation of the former Roman Forum first. 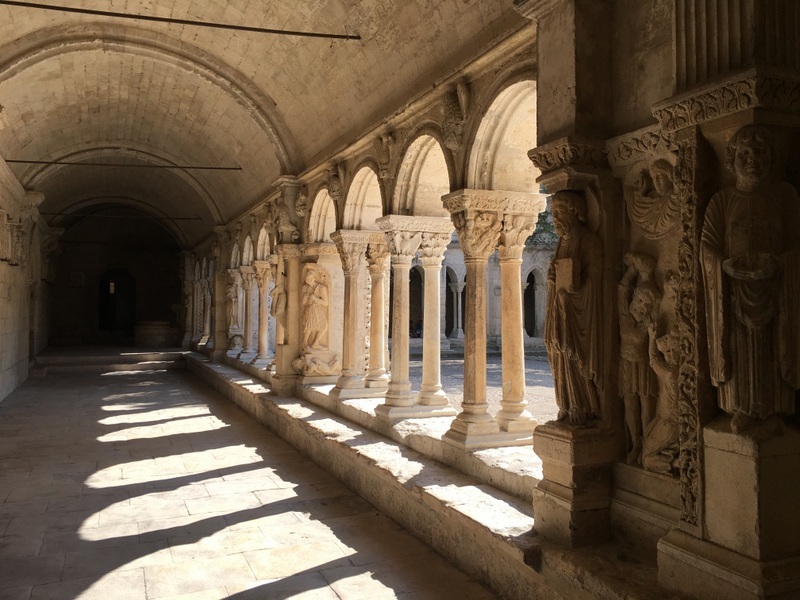 Crowds of tourists in Arles, but this place was deserted. I loved it! 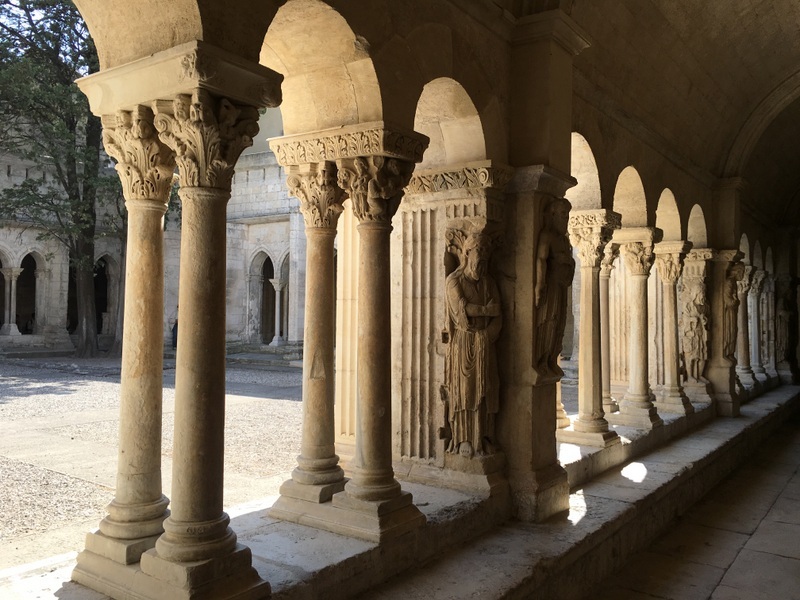 Saint Trophime was built between the 12th and 15th century and is famous for its cloisters. 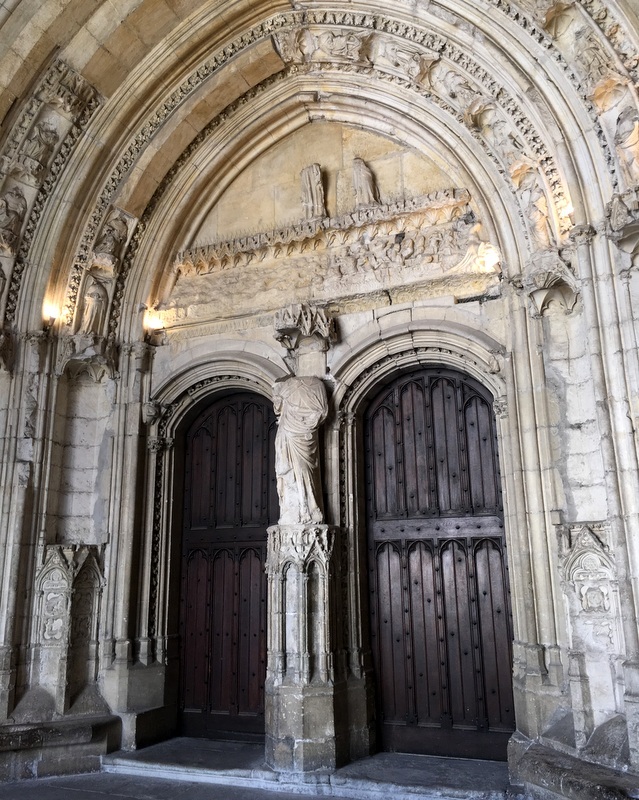 Some details of the columns, fine examples of the Romanesque style, and a photo of the church interior. It had been a long and very hot (38 °C !) day. Before going back to Nîmes, we relaxed for a while on the Place de la Republique, with a 4th-century Roman obelisk in its centre. 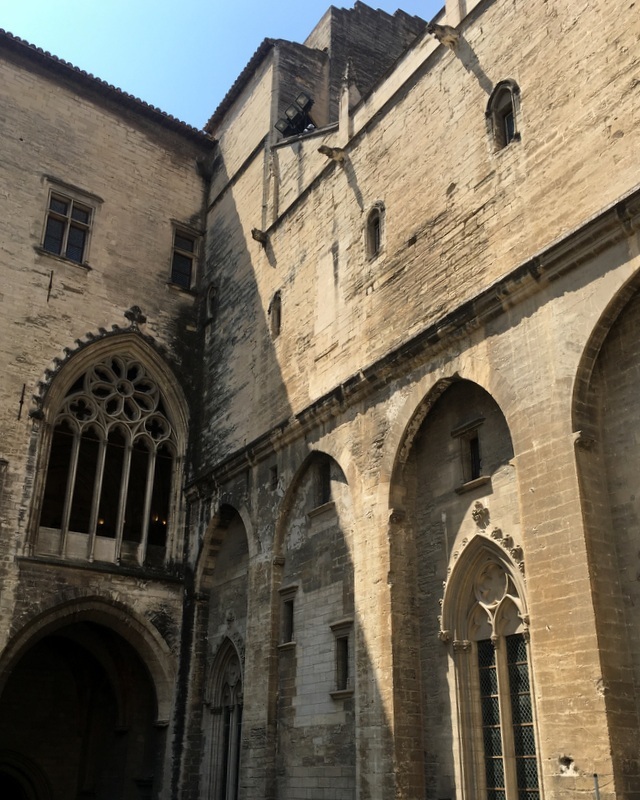 The following day we visited Avignon and it was even hotter. (38 °C). 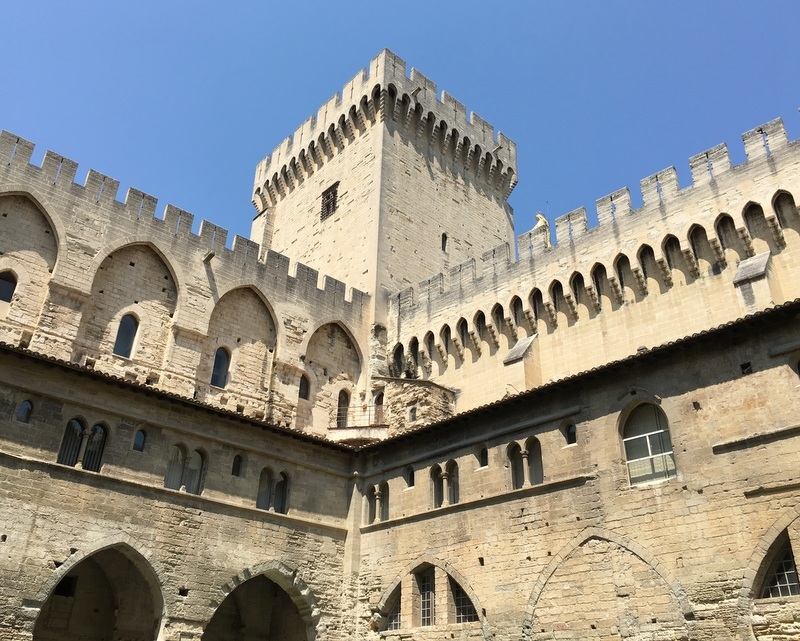 Probably almost everyone will associate Avignon with the famous children song Sur le pont d’Avignon but the real importance of the town is because it replaced Rome as the seat of the Pope in the 14th century, the Avignon Papacy . 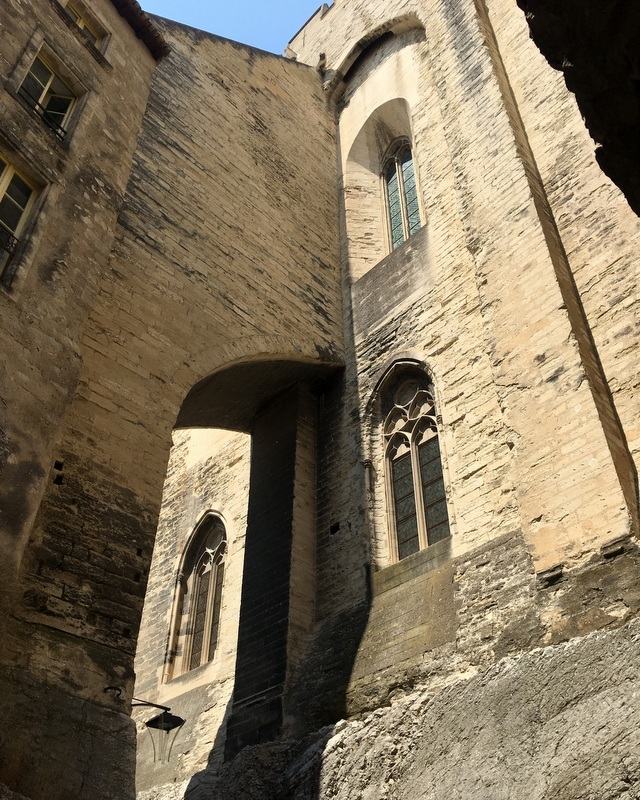 The Palais des Papes is what remains of those turbulent times. 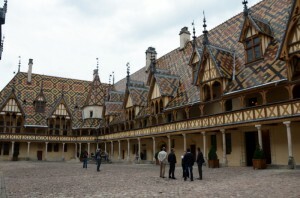 It is one of the largest and most important medieval Gothic buildings in Europe. More of a fortress than a palace, here is an overview taken from Wikipedia to show its size. Bottom left you can see the beginning of the Pont d’Avignon. Because of the hot weather we limited ourselves to the bridge and the palace. Here are my own photos. 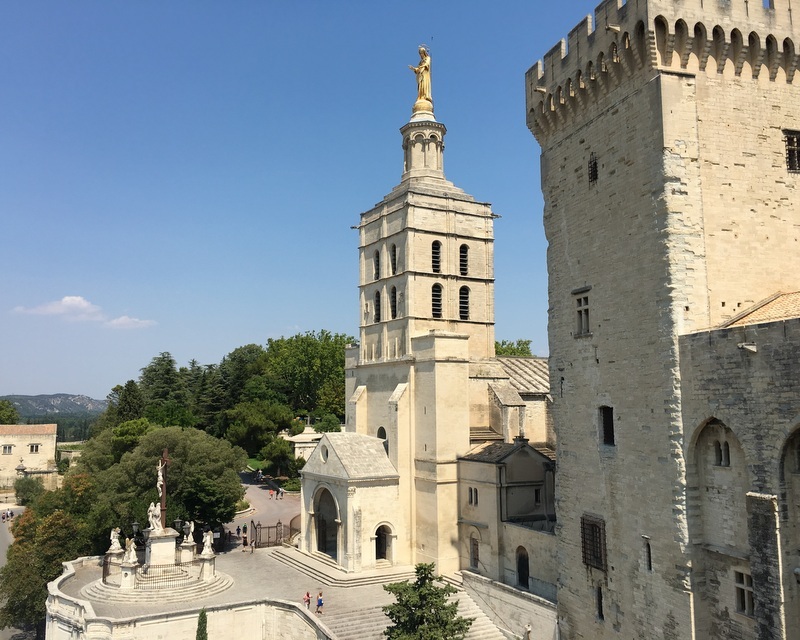 In the top left picture you see the cathedral of Avignon with the prominent statue of the Virgin Marie on top of the belltower. Notice the massive fortifications. The bottom right photo shows a door in the palace. 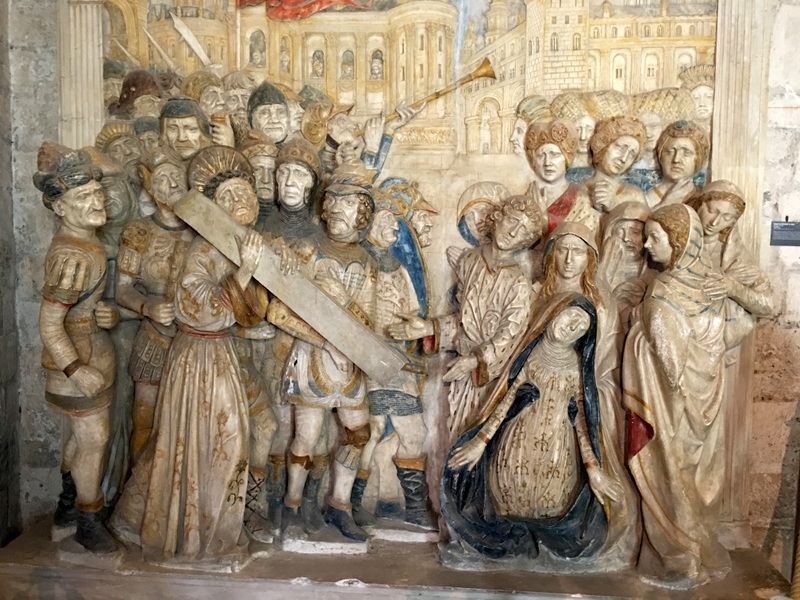 Enlarge it to see the damage that has been done to the statues. And here are pictures of the interior. You can easily spend many hours here. Here is the famous Pont Saint-Bénézet, which is the official name of the Pont d’Avignon. To take this picture we crossed the Rhone river. The bridge was built in the 12th century and had originally 22 arches of which nowadays only four remain. In 1995 the bridge, together with the palace and the cathedral were declared Unesco world heritage sites. 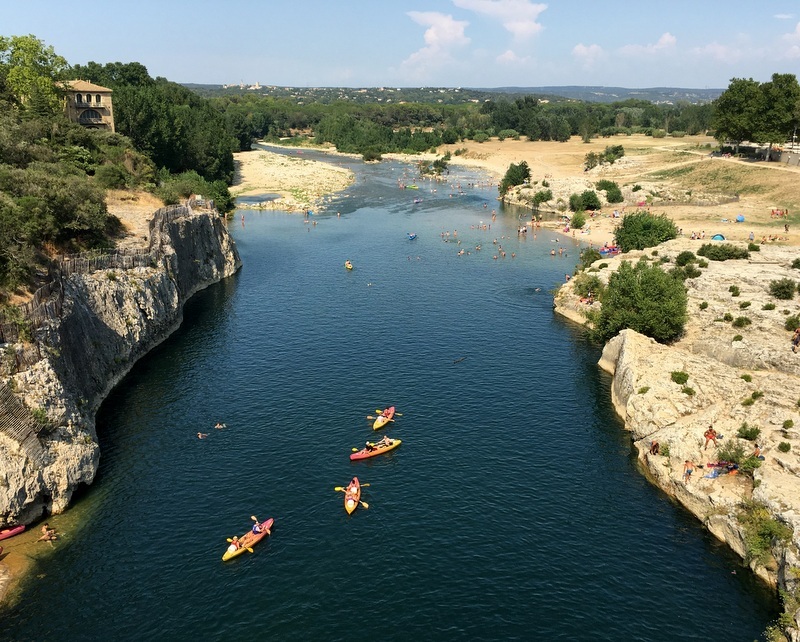 On our way back to Nîmes, we visited another Unesco world heritage site, the famous Pont du Gard. 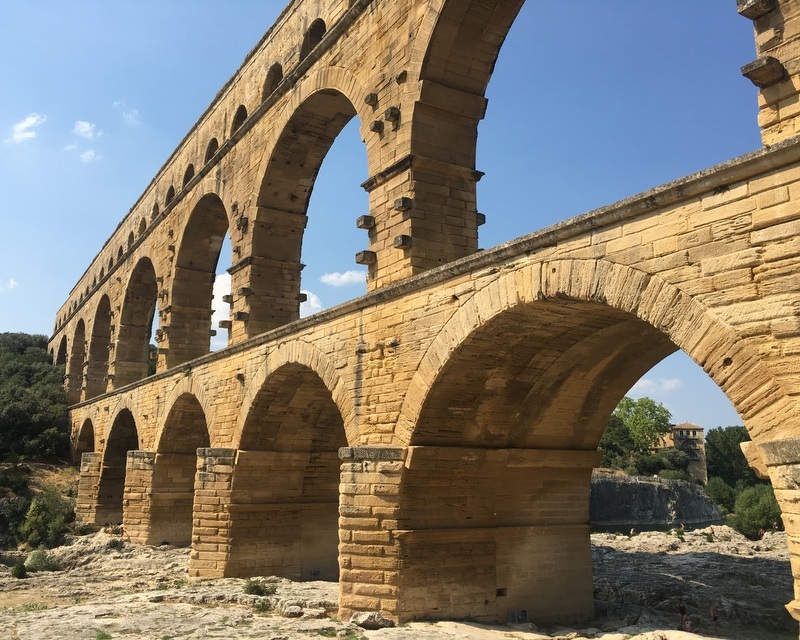 It is an ancient Roman aqueduct, built in the first century AD to bring water to the town of Nîmes. 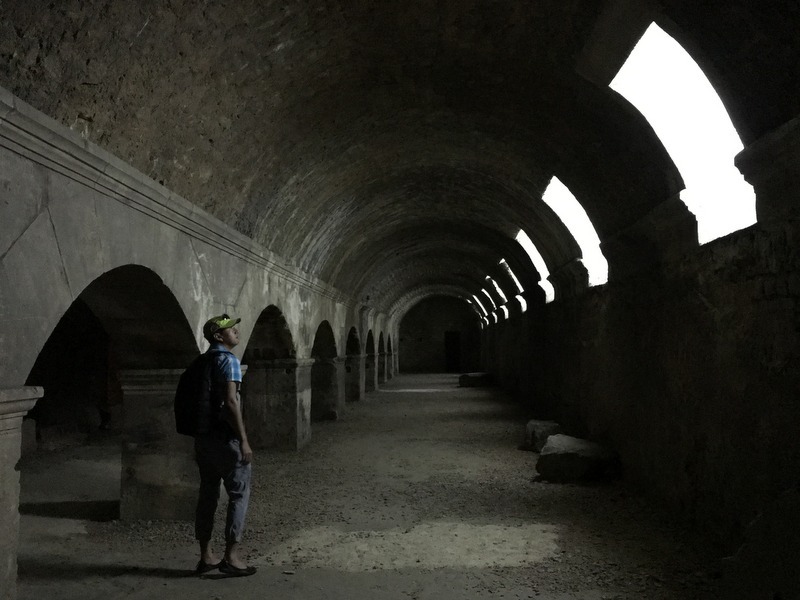 It is the highest of all elevated Roman aqueducts and really impressive. After our dinner we walked back to our apartment. Nice atmosphere, it was a Saturday evening, big crowds everywhere. 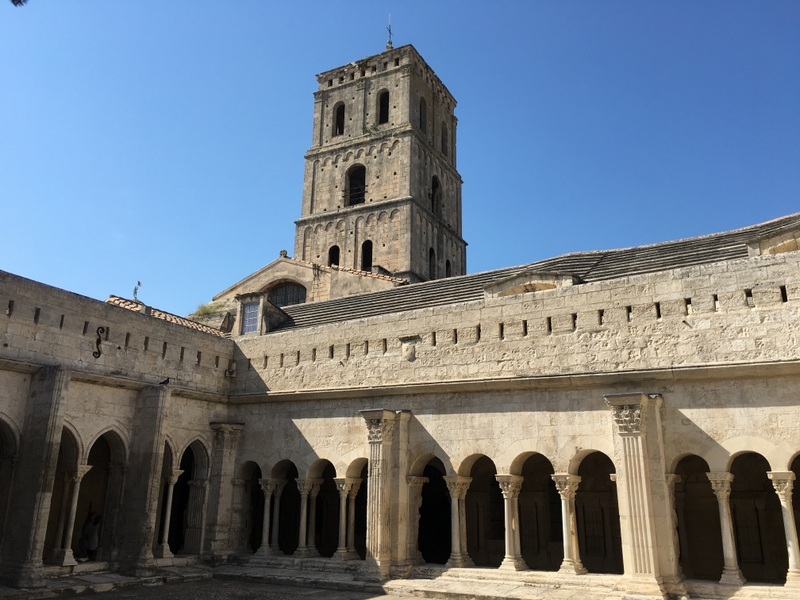 Although we had chosen Nîmes only as a convenient location to visit Arles, Avignon and the Pont du Gard, we discovered that the town itself has also many interesting places. Before leaving next morning, we visited two of them. 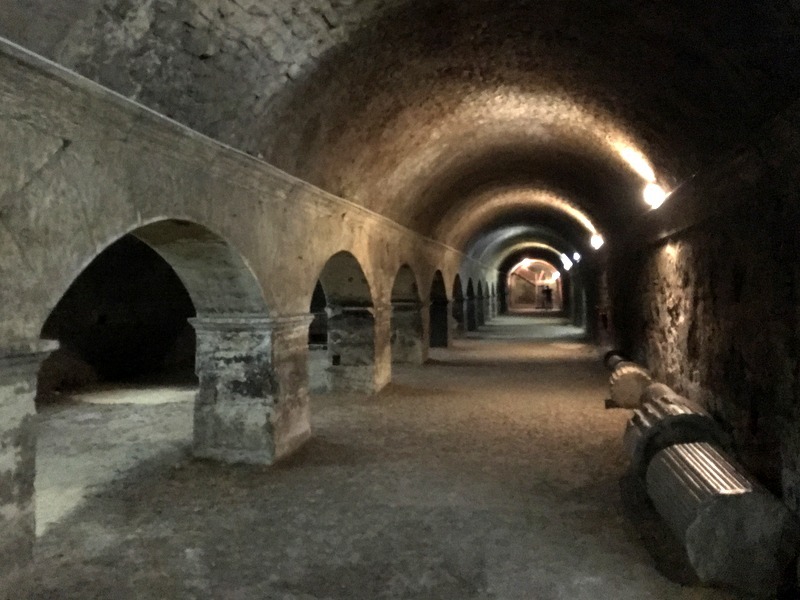 First the Halles de Nîmes. 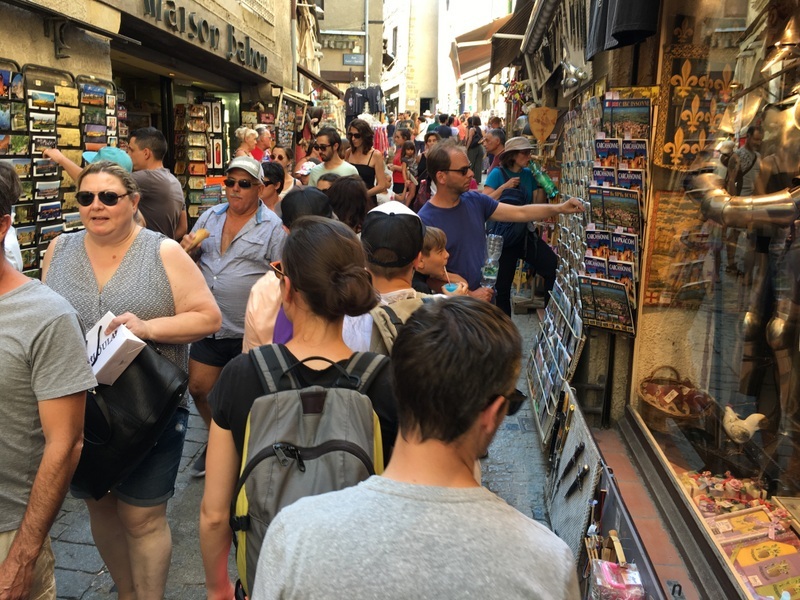 It is considered a major tourist attraction, but for somebody used to the Central Markets of Asia, it was a bit disappointing. Lots of fresh food of course, always nice to take pictures. The Jardins de la Fontaine are a public park, established in the 18th century around a water source. 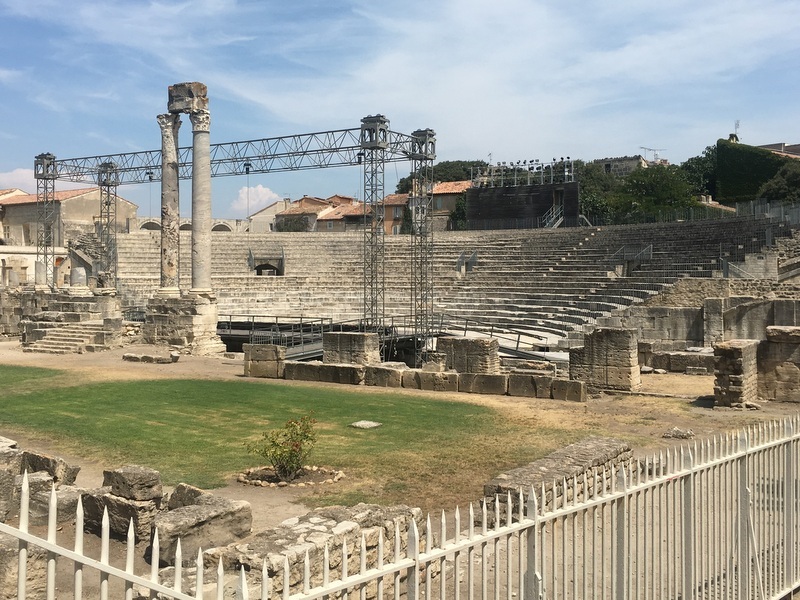 In Roman times this was the center of Nîmes, ruins of the so-called Temple of Diana (not a temple, probably a library) and the Tour Magne can still be seen. 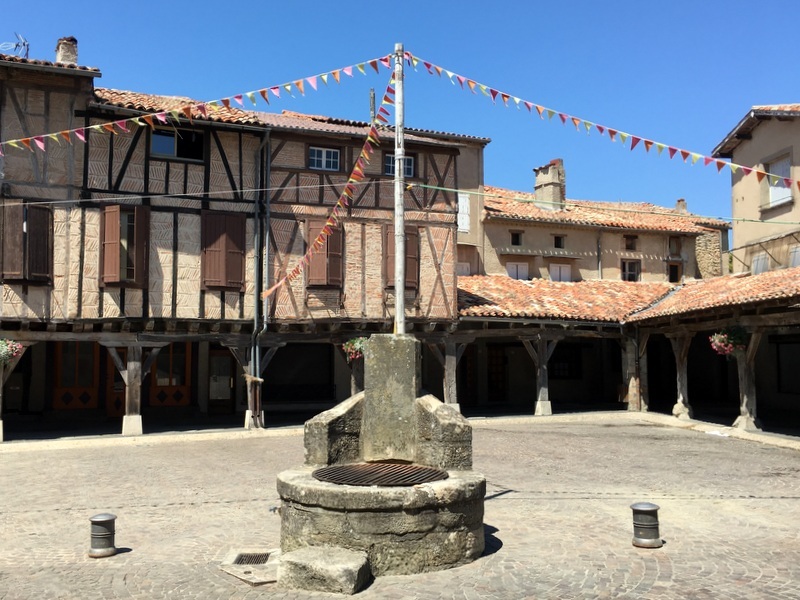 Our next destination was Robiac, a small village north of Nîmes. Why did we go there? That will be explained in part II of this blog. My idea was to travel back from Switzerland to Amsterdam via France. 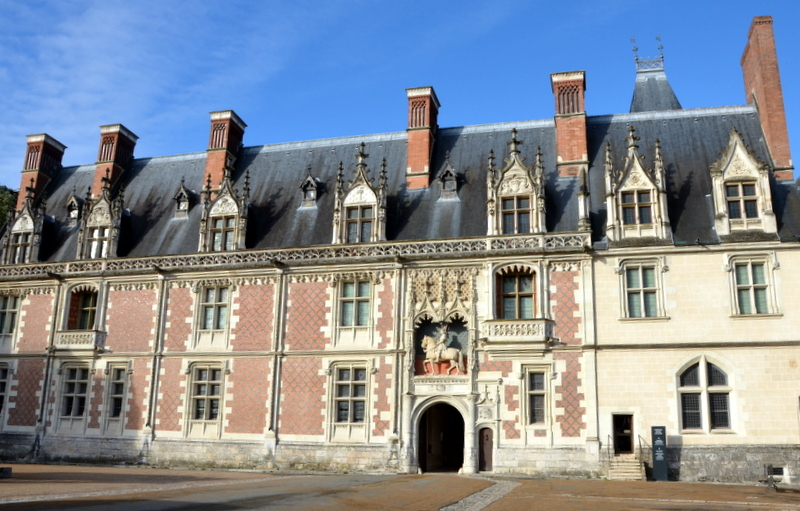 Last year I had visited a few Loire castles with my brother Pim, and I wanted to show their beauty to Aric, so I booked two nights in Blois. 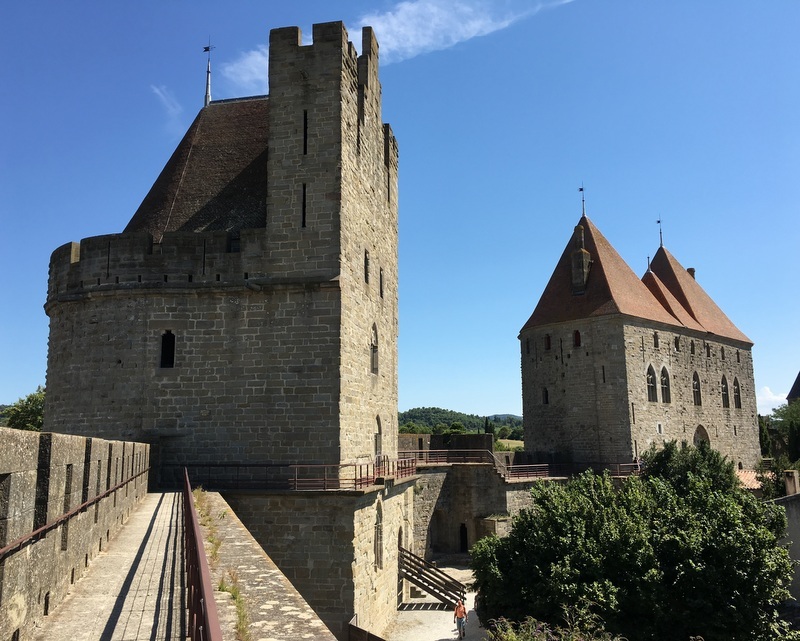 However, planning in more detail, I found that the distance between Grindelwald and Blois was almost 700 km, a bit too long for a comfortable drive. Therefore I looked for a suitable stopover halfway. 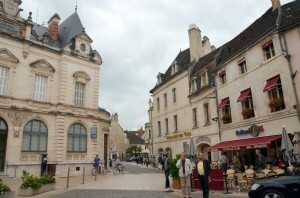 Beaune! To be honest, the name did not ring a bell. Now I know better. Wine lover friends will scold me, because Beaune is the Wine Capital of the Burgundy region. The most important wine auction of France is held here yearly, but we were too early for that. Besides, Burgundy wines are too expensive for me. Well worth a visit, here are some pictures. The hospices also possess a very famous medieval work of art, The Last Judgment (1445-1450) by Rogier van der Weyden. Impressive. The next day it was raining cats and dogs! Still we decided to visit the two castles. And we were not the only ones. It was the National Heritage weekend, there were special activities everywhere and the admission was at a reduced rate or even free. Resulting in crowds of people. 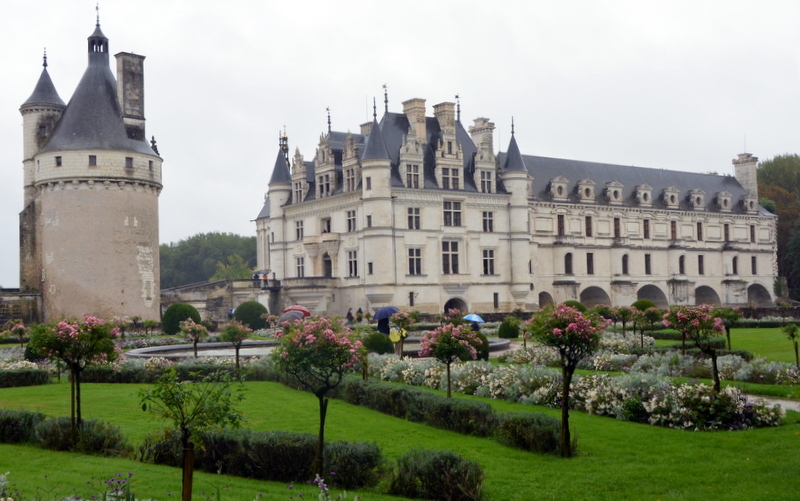 First we visited Chenonceau, my favourite. Because of the rain we skipped the beautiful gardens and spent more time inside the castle. 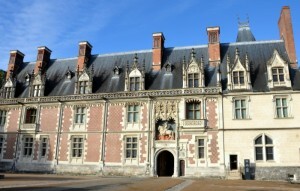 In its present state it dates back to the 16th century. 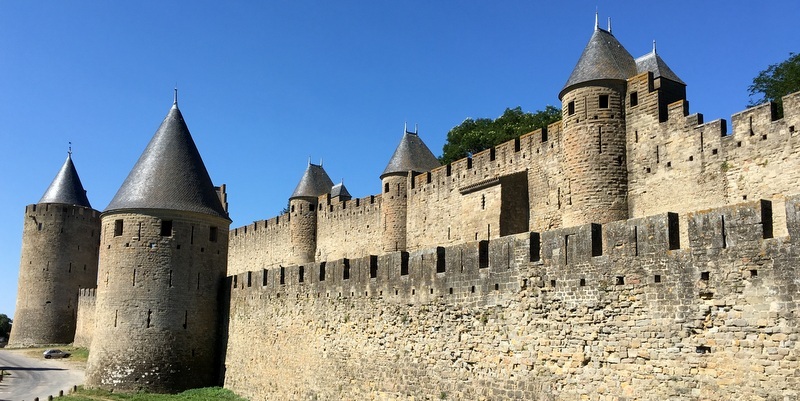 The castle was acquired by king François I and later given by his son, Henry II to his mistress Diane de Poitiers. 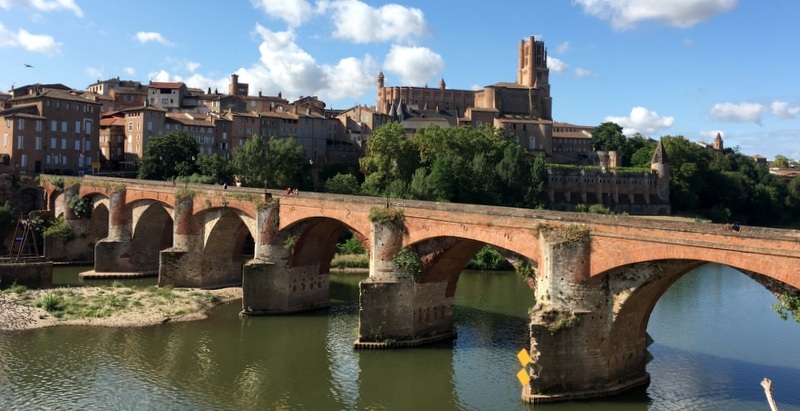 She commissioned the building of the famous arched bridge across the river Cher. 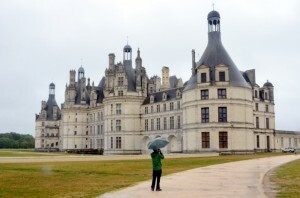 Next destination was Chambord, the largest of the Loire castles. 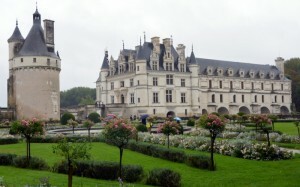 If Chenonceau is androgynous, Chambord is alpha-male…:-).Built by the same king François I and possibly designed by Leonardo da Vinci. Are you interested in philosophy? Then you may think about the caption with Aric above: “The present king of France is Chinese” True or false? We arrived in Amsterdam just in time to return our car. About 3500 km in two weeks time.